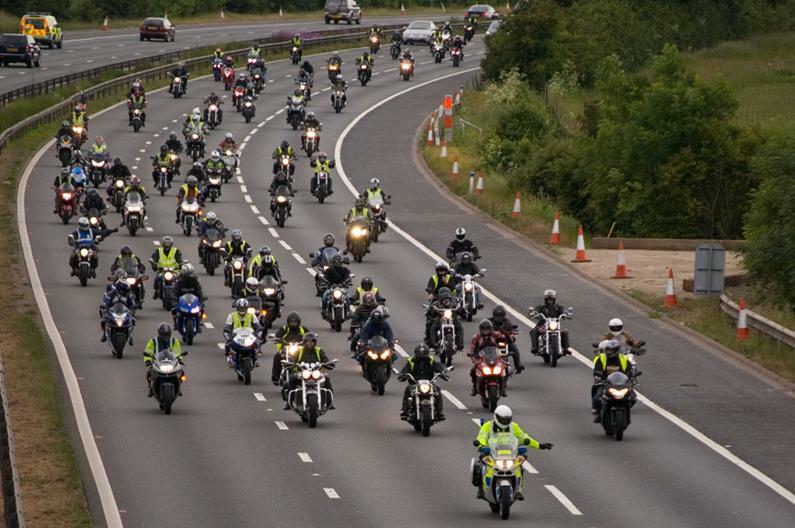 Thousands of motorcyclists from all over the United Kingdom took over the London Orbital M25 motorway yesterday in protest at a parking tax imposed on them in Central London by Westminster City Council. Despite receiving 8,000+ written objections and not a single letter or email of support, the council decided to go ahead with its much hated motorcycle parking tax, which not only obliges each motorcyclist to hold a debit/credit card and mobile phone, but also forces them to shout their card details over the phone, in the middle of the street and in the pouring rain. In an environment where financial institutions are taking draconian measures to prevent and fight against fraud, motorcyclists have no option but give their credit/debit card details by phone or SMS from their parking spot. Parking facilities in Central London have remained in exactly the same conditions as when their use was free of charge (e.g. no security devices to attach bikes to and no individually delineated spaces forcing bikes to squeeze in parking bays like sardines in cans), so bikers see absolutely no reason for a charge to be imposed on them when no value-added service is being provided by the council. 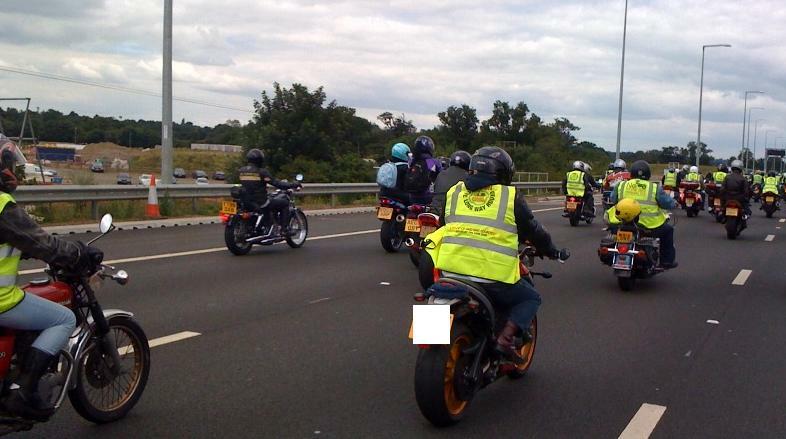 Thousands of angry bikers gathered between 10am and noon at the Ace Cafe in West London and then headed towards the M25 motorway where they protested for six consecutive hours, before ending up in Central London, right under the nose of the authorities. 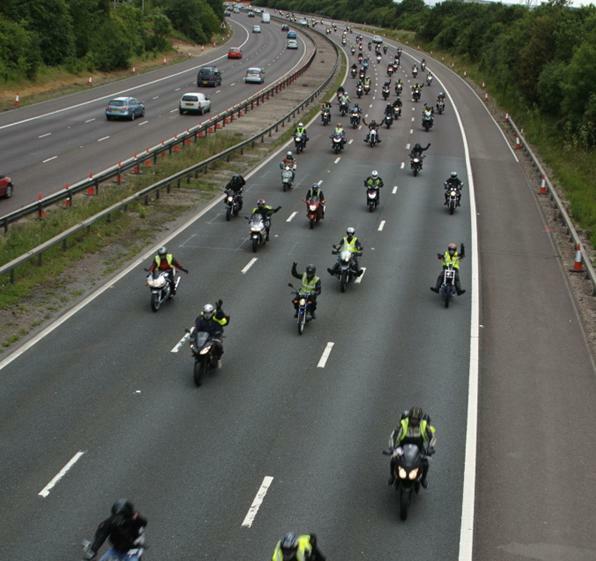 It was just amazing to see endless queues of bikers on the busiest UK motorway, thus considerably slowing down the traffic and causing significant delays to the journey of thousands of motorists. All this of course because of Tory Councillors Colin Barrow (Leader of Westminster City Council) and Danny Chalkley (former Cabinet Member for Transportation and Parking) refusing to listen to the public and failing to recognise the basic principle of democracy, when the same thousands of motorcyclists officially objected to the much hated bike parking tax twice in a row. The message addressed by this demonstration to Westminster City Council and any other UK authority was simple: bikers form a strong and united community who stand up for their rights and stick together to fight against any piece of anti-bike legislation thrown at them in a view to raising revenue or discouraging the use of motorcycles in the UK. The same bikers form part of a growing community made up of thousands of individuals who will not go away and are prepared to join forces by legally causing severe disruption until the parking tax is fully scrapped. The bikers will accept no compromise whatsoever. The demonstration attracted strong media coverage with the BBC interviewing the organisers right from the start. How embarrassing this demonstration had been for Westminster City Council, which not only took place outside their borough to raise awareness nationally and internationally, but also inconvenienced the journey and schedule of thousands of UK citizens. Other European motorcycle protest groups sent representatives to the UK to report the event, including the Fédération Française des Motards en Colère (FFMC – the French Federation of Angry Bikers) for which the mission is to fight against any piece of anti-bike legislation introduced in France. The FFMC representative was extremely impressed by the huge attendance to the demonstration and the remarkable, peaceful and exemplary behaviour of British bikers while protesting and standing up for their rights. A number of bikers from the continent made their way to the UK to support their British neighbours in their fight against Westminster Council’s motorcycle parking tax. The fight, organised and managed by the No To Bike Parking Tax campaign, is now taking an impressive international dimension with many biking communities across the globe sending strong messages of support. Meanwhile, no other UK council has dared to introduce a bike parking tax in their borough and follow the Westminster example. Other authorities that thought this might be a good idea have actually abandoned their plans because they are very well aware that should they even think about imposing a parking charge on bikers, they will see the No To Bike Parking Tax campaign coming their way and cause severe disruption and humiliation in their borough. The demonstration took place just a few days before Westminster City Council is due to be taken to the High Court of Justice by the bikers, where the legality of the motorcycle parking tax will be challenged. It is currently alledged that the parking charge has been introduced in a pure view to raising revenue rather than recovering costs. In the UK, local authorities are not allowed to introduce parking charges to make profits or raise revenue. Even if they lose the court case, the bikers are more determined than ever to continue to severely disrupt and embarrass the council until the parking tax is abolished. 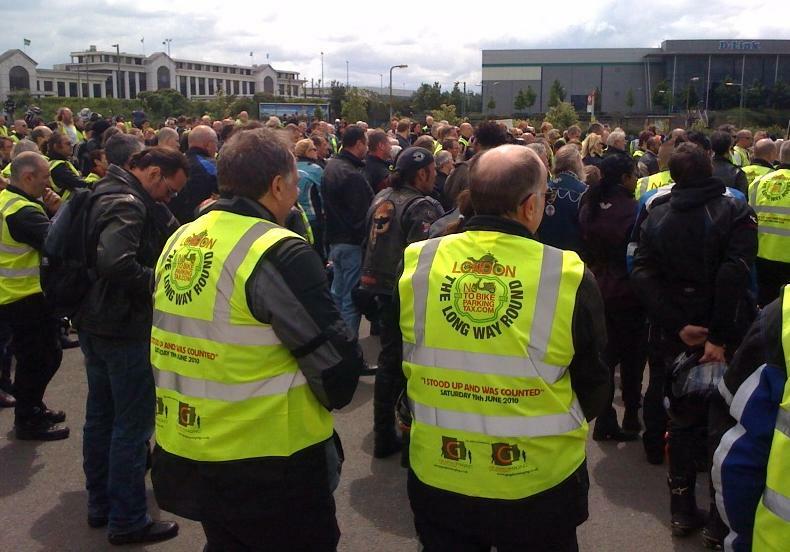 THOUSANDS OF BRITISH BIKERS STOOD UP AND WERE COUNTED. LET THE PEOPLE WHO RIDE DECIDE AND NOT BE INTERFERED BY POLITICIANS WHO HAVE NOT GOT THE SLIGHTEST IDEA ABOUT MOTORCYCLING. Westminster City councillors should take note and reverse the decision to make the parking tax permanent. Bikers from all over the country are uniting and will fight any anti bike legislation. The parking tax will be scrapped, no matter how long it will take, the demos will increase in numbers and Westminster will be paralysed. The M25 parade is just a taste of things to come. Westminster city councillors are not used to be challenged but then we are not sheep and we will fight for our freedom. The London The Long Way RoundM25 motorcycle demo was amazing. Not only was it a fun ride out for all the motorcycle and scooter riders that attended, it also shows the strength of the biking community. Motorcyclists and scooterists, unlike car drivers, won’t just roll over and let councils shaft them. If car drivers protested about the expensive car parking fees, we wouldn’t be in this mess now. The M25 protest sent a strong message to Westminster Council, Camden Council, Kensington & Chelsea and any other London borough or UK council that is even thinking about introducing parking charges for motorcycle bays. Motorbikes, mopeds and scooters relieve congestion on our busy roads so they should be encouraged by the authorities (just like bicycles). If every other country in the world can let motorcycles park in motorcycle bays free of charge, why can’t Westminster Council? Why do they think the City of Westminster is so different? Motorcycle parking shouldn’t be just another revenue stream. Anyway, a big thank you from me to the NTBPT campaign group and all the dedicated motorcycle and scooter riders who came along to London The Long Way Round (or The Great Lap of London, as some people call it). I hope the Westminster motorcycle parking charges are abolished soon! 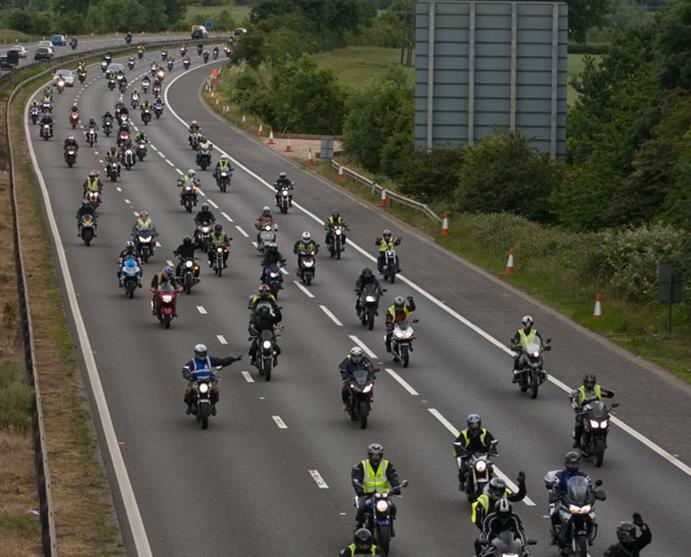 The London The Long Way Round M25 motorcycle demo was amazing. Not only was it a fun ride out for all the motorcycle and scooter riders that attended, it also shows the strength of the biking community. Motorcyclists and scooterists, unlike car drivers, won’t just roll over and let councils shaft them. If car drivers protested about the expensive car parking fees, we wouldn’t be in this mess now. The M25 protest sent a strong message to Westminster Council, Camden Council, Kensington & Chelsea and any other London borough or UK council that is even thinking about introducing parking charges for motorcycle bays. Motorbikes, mopeds and scooters relieve congestion on our busy roads so they should be encouraged by the authorities (just like bicycles). If every other country in the world can let motorcycles park in motorcycle bays free of charge, why can’t Westminster Council? Why do they think the City of Westminster is so different? Motorcycle parking shouldn’t be just another revenue stream. Anyway, a big thank you from me to the NTBPT campaign group and all the dedicated motorcycle and scooter riders who came along to London The Long Way Round (or The Great Lap of London, as some people call it). I hope the Westminster motorcycle parking charges are abolished soon!